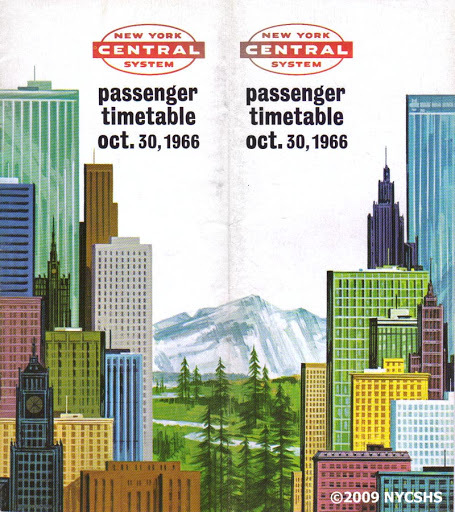 City skyscrapers and mountain scenes dominate the cover of the October 30, 1966 passenger timetable. The illustrations are generic enough to be suggestive of many scenes, none of which look like territory served by the Central. While the railroad was looking to cut costs, they spent money to change timetable designs with nearly every issue! Dramatic illustrations accompany a system map on the inside of the October 30, 1966 timetable. Fresh on the heels of setting the American record for rail speed in July, the inside of this timetable touts the accomplishments of its technical research in providing better transportation solutions. 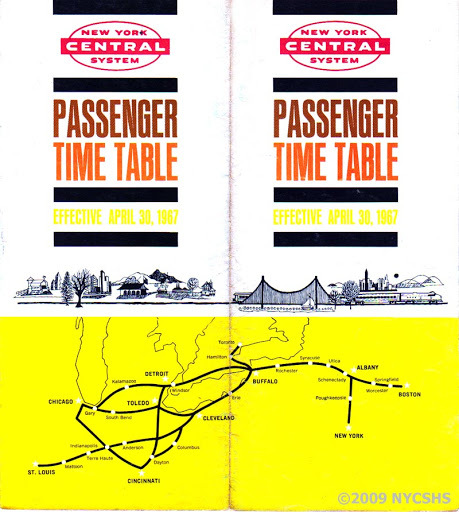 Yellow was the dominant color for the April 3, 1967 edition of the system timetable. 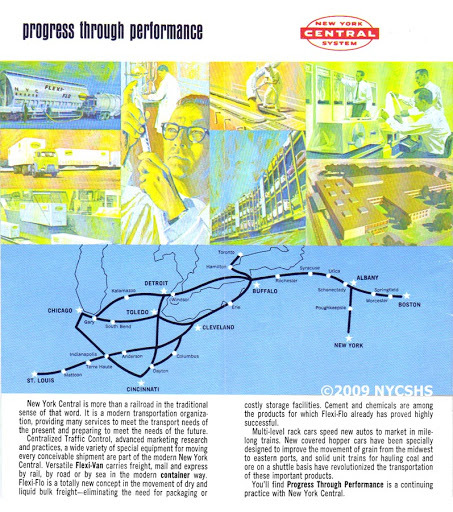 A stylized route map was complimented by a playful illustration of a train traveling from countryside on the back cover to big city on the front cover. The use of bright yellow is very attention-getting. 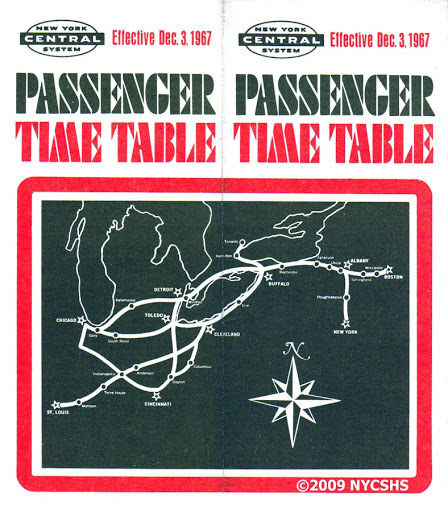 The Central went for an all-blue look for its November 3, 1967 system passenger schedule, including the same stylized system map. 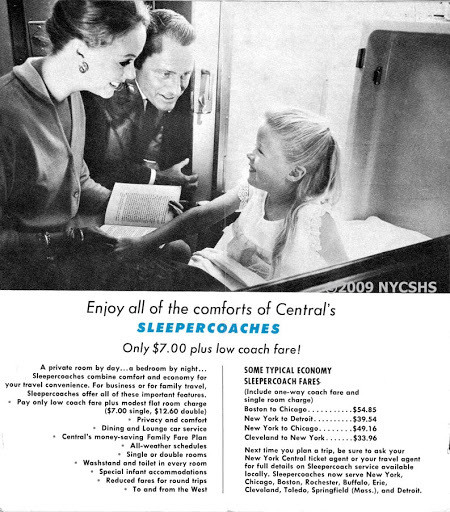 Inside were dramatic passenger service cuts and “rationalizations” ordered by president Alfred Perlman as cost-savings measures. This would be the last timetable to carry the Twentieth Century Limited, which departed Grand Central Terminal for the last time on December 2. “The beginning of the end…” The December 3, 1967 edition adopted a different cover design, using the same stylized map from earlier editions. Dramatic cuts in passenger service included the elimination of the flagship Twentieth Century Limited, as well as all other named passenger trains, with the odd exception of the James Whitcomb Riley. 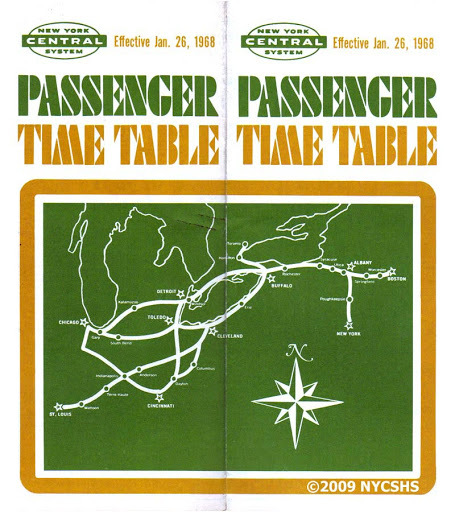 Here is the last New York Central system timetable published, effective only five days before the Penn Central merger on February 1, 1968. 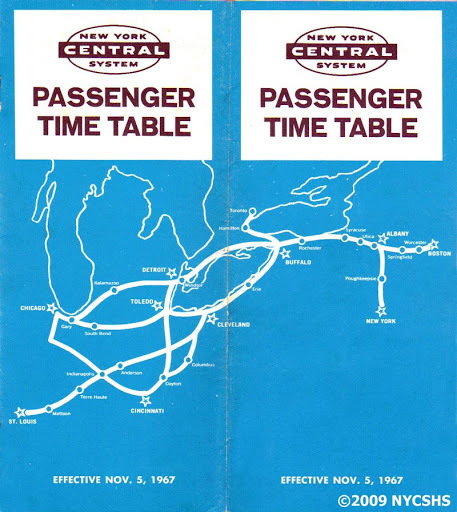 The timetable shows three trains east, three trains west, and five each way between New York and Buffalo. The five trains to Buffalo were shown in December 1967, but without the “Empire Service” name. Huge passenger service reductions took place west of Buffalo. This entry was posted in Research Information. Bookmark the permalink. How About a Ride in the Hickory Creek?